Last year, these First Day of School Free printable signs were a huge hit and I have had a ton of requests for the new school year version! Welcome the 2014-2015 school year and snap a picture of your kid(s) on their first day! I am excited to add a few new ones this year like “First day of Junior High”, “First day of High School” (if your high schoolers will still let you snap a picture of them on their first day!) and “First day of School!” for families to get a picture together with all of the kiddos. Download the printables by clicking the appropriate link for the grade level you need below. 1. Make sure you printing Landscape (wide), not Portrait(tall). 2. Select Scale to Fit (or similar setting on your computer) and make sure you can print the entire image. These are high resolution printables so you can print them at pretty much any size so make sure you scale to fit the paper you are printing on. I like to use “Print Entire Image” then trim it down if I need to after it prints. 3, Print on heavy cardstock or mount your printed paper on something sturdy so the kiddos don’t bend it all up during your First Day of School photoshoot! **UPDATE: Unfortunately, due to the high volume of requests, I am unable to personalize these printables and/or email individual .jpg files. I have added all of the images (HERE) so you can save them to your computer and print if the .pdf download isn’t working for you! Hope that helps!!! I really hope you and your kids enjoy these printables! Be sure and tag us on instagram (@classyclutter) if you use one! We LOVE to see our printables in action! 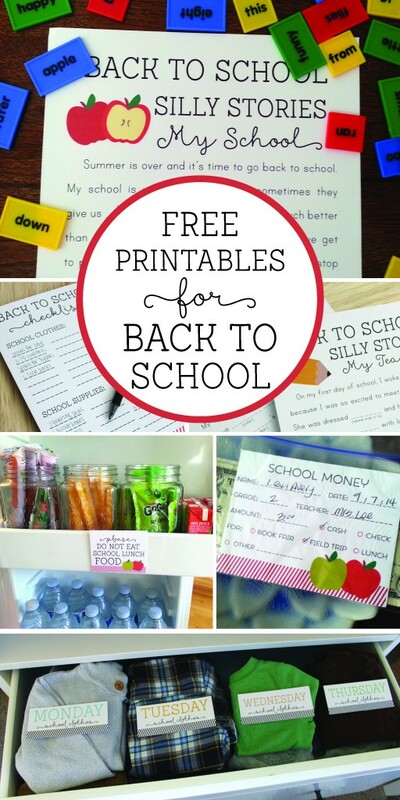 You might also want to check out these other awesome Back to School Printables! What program do you use for your graphic design? I use Adobe Photoshop! 🙂 thanks for stopping by! Thanks so much for making these cute signs! Just was wondering if there was a way I could get them in JPEG format like you did last year rather than PDF format. Hi Becky! Which one do you need? I can email it to you! Oops! I meant the Back to School series! Lauren. Thank you so much! This is the best one I’ve seen! Is it possible for one to be made for 1st day of Young 5’s? I love these! My daughters are going into Young 5’s. Which is similar to Pre-K. I don’t have them posted yet (only from last year) but I will have them so keep in touch! Any update on these “Last Day” signs yet for 14-15? Thank you! I am a high school principal and we have some fun as kids of into the building on the first day with pictures. I would love to get a sign just like these that says, MY LAST FIRST DAY OF SCHOOL. If I could get a template I would love it because we could have fun with CLASS OF 2015, 2016, 2017. & 2018. I will give you the credit or pay a fee to have someone make them for us. These are great and we will share pics. Thanks is you can help! I was able to print it this morning and now it will now download for me to get one for my niece and nephew. 2nd and 5th grade. Thank you for offering this, it is great! Hi – Love your signs! I’m wondering if the signs are editable? In Canada, Kindergarten is 2 years and designated by Junior Kindergarten and Senior Kindergarten. These ones are not editable but you could download it and add the word Junior or Senior to the printable using Picmonkey.com. It’s free and has similar fonts to the ones on these signs! My son doesn’t start Preschool until next year, but I would LOVE to use these. Would there be a way to get them without the dates on them? These are adorable!!! Thank you so much for sharing!!! Any chance you happen to have one that says first day of Transitional Kindergarten? I know this may be weird haha but I am starting nursing school this month along with my daughter starting kindergarten and my son starting preschool so I was kind of thinking of taking a picture with a sign too so at the end of the year I can do a little “newsletter” for my family and include those. Any way you can make up a sign that says first day of Nursing school? Haha I know totally cheesy but just thought I would ask. Totally okay if you can’t! These are great. Thank you! Another request for a set without the year 🙂 I want to print out a set for my 3 kids to share so they can use the same signs. Thanks again! Can you email me the jpeg files for 1st and 3rd please? Thank you!!!! Thanks for making these. Would they print okay in black and white? I would feel weird for using this without saying “Thank you”! So THANK YOU!! 🙂 Love them! Hi there! Thank you SOOO much for making these and sharing them with all of us! 🙂 I was wondering if you could email me the jpeg files for 1st grade, please? Your signs are awesome! I am so excited to use this for my little guy who is starting kindergarten this year. Would you please send me the jpeg file for kindergarten? And like Jessica’s comment, do you have a generic template so I/we can edit yearly so I/we can have a consistent look throughout their school years? Thanks!! these are great! could you email me the jpeg for kindergarten and 4th please? LOVE these signs!! I would love to make one for my husband that says first day of paramedic school…..how could I do that?? Could you please send me Pre-K and Secong grade in jpeg so I can add names. I wanted to Thank you, for thinking of everyone! I used the 1st day of school for my 2 yr old son who’s started a mother’s day out program…..You were the only one that gave me that smile, he was so cute holding up that sign!!! You are awesome, thank you so much for your generosity and sharing your creative genius! Thank you for taking the time to make these! I love them for the scrapbook. I love these so much, I used them last year too when my son started Kindergarten! I’m worried that you won’t still be making them years down the road. Are you willing to send me the photoshop file so I will be able to edit them with the current year? Thanks so much for making these!!!! These are so cute – thanks for doing this!! Love these. Any chance you’d think about adding a sign for the littlest one who’s still at home? “Still Home”? I agree with the Commenter who said she was OCD and wanted these for the next 18 years! Would you please consider making an editable pdf so we could print all the ones we need out? Thanks! Thank you for making my first day pictures be so good. Muchly appreciate the free printables! Thank you so much for the time and effort to make these. They are great props for the first day of school picture! do you guys have any for the last day of school? :] thank you so much! These are wonderful. I love that they have the grade and the year! Thank you so much for these! Do you happen to have matching ones for the last day of school? LOVE these!! Just wondering if you might make the signs without dates so that I can use them for all my kiddos year after year. I know others have requested the same…maybe something to consider down the road. Thank You! Thank you soooo much for creating these and making them available for no cost! I was scrambling at 2:00am before the first day of school to make my own signs but weren’t very successful. Defeated decided to do a quick google search that lead me to your fabulous blog. Seriously can’t thank you enough ! Would there be any possibility of creating a ‘Last Day of . . .’ set of signs in this same design? Hi Cheryl! Yes! I do it each year! I know that it’s a little early but I wanted to know if you will be creating similar signs for the last day if school? I absolutely love your signs and I used one for my daughter’s 1st day of Kindergarten this school year. I hope to hear from you soon! My son’s last day of pre-school is tomorrow and I cannot find a download for the last day sign. Am I missing it somewhere? I used this on his first day and I would love to use it for his last day too! Did I miss the Last day of school ones? I used the first day one and would love to do last day and my little finishes school next week. Thanks! Uploading them now! Thanks for checking in! Oh, no! Now I need 2015-2016 because my child starts school in July! These are perfect! Can you help? Thanks! They should be out very soon! Please check back this week! My child starts school on Wednesday! I used this last year and it was a memorable picture – thank you for sharing these – super generous! Looking forward to 2015 to come out, hope it’s in time! 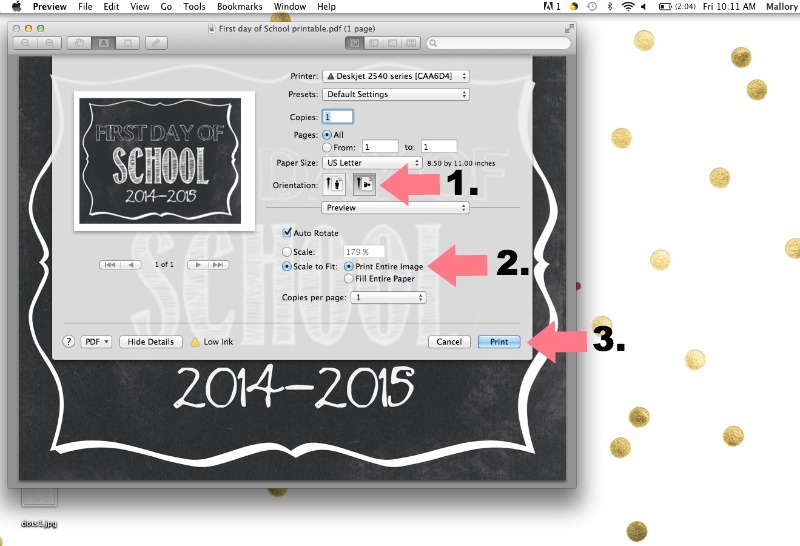 Will you be updating the first day and last day of school signs with the 2015-2016 school year date? If so, when will they be available? Will you be updating for the 2015-2016 school year? Thanks! They will be available for free download on Saturday at 7am EST or you may purchase an editable version on our Etsy Shop. Hi! I found you on Pinterest and wondered if you will have 2015 – 2016 First Day of School Printables available? Will you be updating these for the 2015-16 school year? Do you have these for 2015-2016? Than ks!! When will you have the signs posted for the upcoming school year so 2015-2016? Thanks! When will you post the signs for the upcoming school year so 2015-2016?? Thanks! Hi – I see the link to purchase the 1st day 2015-2016 printables, however I can’t seem to find the free downloads you mention are ready. Thanks so much for these. So cute! Thanks for taking the time to share. Do you plan on updating for 2015-2016. My son starts Pre K this year at my school…Fruedien001@aol.com (if you do). Many thanks! We are posting them on Monday! Do you plan to update these for this year? I love them! I have used them the past two years with my girls 🙂 Thank you so much for posting them! Are you going to make 2015-2016? Do you have these available for 2015-2016 school year? Thank you so much! They are very cute! Hi! I loved using these last year. Do you have updated signs for 2015-2016? Thank you!! Kristin. Is there any way to get an updated “First Day of School” for Kindergarten with the dates 2015-2016?? These are the cutest! I am so excited to use it tomorrow for my little miss’s first day of preschool! Thanks girls! Your signs are fabulous! Can you offer one for HOMESCHOOLERS??? Are you going to do 16-17? I love these and was looking for 2016-2017 as my boys are starting school next week! Yes, next week. Living in Arizona we start early. Are you planning on putting some out for 2016-2017? Love these! Do you have 2016-2017 first and last day signs? Thank you! Hi! Checking to see if you have updated these for 2016-2017?? I looked but was not able to find them and I have no clue how to do my own like this. So thank you so much for doing this!! Hello! We have them in our Etsy shop this year! The link you have for 16-17 above is broken. Hopefully it can be fixed! The link for the 2016 – 2017 is broken – can you update it? i as trying to print the 2016-2017 firsat day of school sign but the link does not have a hyperlink attached to it? I am so sorry it wasn’t working try it now! Do you have them for 2017-2018 yet? Thank you! LOVE these printouts & have used them the last TWO years!! Would like to continue using them. Do you have a current “First Day of School” for 2017-2018 school year?? Need 2nd grade please! !